Fidel’s has been in Westport, MO for almost 20 years. The enclosed space creates an intimate environment that sparks conversation and friendship between the locals and those that are just passing through. We can ensure that you will always feel welcome at Fidel’s whether you are an avid cigar connoisseur or are just having a cigar for the very first time. Upon arriving at Fidel’s, you will be guided through the store to assure you get the right cigars and accessories for your tastes and needs. Our Tobacconists are well-versed in the world of quality cigars and will walk each customer through the different sensations each cigar presents. Fidel’s is located in one of the oldest buildings in the area, built in 1857 in the heart of Westport – easily accessible from the Country Club Plaza, Overland Park, Leawood or the Northland. The address is 4112 Pennsylvania Ave, Kansas City, MO 64111. What kind of cigars do you offer? 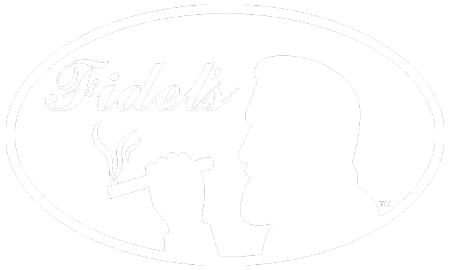 Fidel’s does not carry any products we wouldn’t smoke ourselves. With over 300 premium cigar varieties from legends like Ashton, My Father Cigars and Arturo Fuente to exciting new blends from Tatuaje, Leaf by Oscar, and Black Label Trading Company. Pipe lovers appreciate our Peterson briar pipes, and selection of Aromatic, Non-Aromatic and English Tobaccos. Come relax in our cozy Smoking Lounge while enjoying your favorites, or try a new product with the help of our staff and your own personal taste. What is the lounge like? The lounge is decorated top to bottom in historic cigar memorabilia. From the classic mold press in the front of the store to the vintage wall art in the lounge. Fidel’s Cigar Shop inspires tranquility and a “stay and relax” feeling with our plush, comfortable seating. Clients are more than welcome to watch their favorite sporting events on our two 65 inch HD TVs or take advantage of our complimentary WiFi. Members can also enjoy our humidified lockers to properly store their treasured cigars. Who might I run into at Fidel's? Fidel’s has an open door policy; We welcome anyone who stumbles on our piece of heaven. Whether you’re new to the cigar world or an expert who wants to enjoy our unique variety of cigars, you’ll feel at home at Fidel’s. Our customers are sure to find the cigar that is best suited for their individual taste. Mild, medium, or full; Fidel’s has the right cigar to send your taste buds on a journey and fill your palate with exotic wonders. Each individual that represents Fidel’s Cigar Shop has an extensive knowledge of cigars. They will be able to help each customer understand the difference in blends, origins, wrappers and the detailed composition of each cigar. Our staff will create a guide to the perfect cigar for each client based on the person’s previous experience, tastes and dislikes. Fidel’s has two Tobacco Artisans that can give clients a detailed and hands-on explanation of the cigars we offer, as well as answer any questions they may have about cigars and the cigar industry. At Fidel’s, we pride ourselves on our genuine interest in our customers. In an environment where detail is everything, we fine comb every piece of a cigar to find what really makes it special and always go beyond the usual to make you feel like you are talking with one of your close friends.